This footed antique quadruple silverplate tea set by Pairpoint Silver depicts the celestial motif of Orion and Canis Major! A VERY highly collectible Victorian theme that encompasses mythology and the Victorian era. 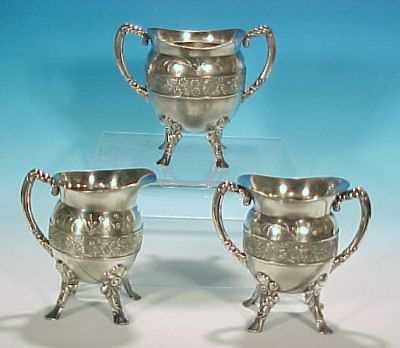 Creamer, open sugar bowl and waste bowl all in quadruple silverplate. All of the pieces of this Pairpoint quadruple silver plate tea serving set have a satin finish on their bodies, a decorative band around the center depicting Orion, Canis Major, flowers leaves and a cartouche in the center of the front - which could be engraved with your family initials! All three antique silver pieces of holloware have four applied floral feet, rope-like handle/s hand-tooled flowers, vines, buds and berries on the upper 1/3 of the body and brightly polished silver on the insides. The footed waste bowl measures 13" in circumference, 7" from handle to handle, 5.5" high and weighs 15.1 ounces. The applied handles show some silverplate wear, the rim is a bit rough and the inside shows tiny surface scratches from wear. One of the feet is very slightly bent, which may cause the waste bowl to slightly rock when moved. But it stands stable when the other three feet are firmly planted. The matching footed silverplate creamer measures 10.5" in circumference, stands 5" high, 4.5" from the tip of the creamer spout to the handle and weighs 12/6 ounces. The inside of the creamer shows very minor wear marks, and we note one slim dark stripe of discoloration of the silverplate extending from the underbelly up through the center band of decoration. Barely noticeable unless one was especially looking for it. The four feet are perfectly aligned and stable. The matching silverplate sugar bowl measures 10.5" in circumference, stands 5" high, 4.5" from the tip of the creamer spout to the handle and weighs 13.2 ounces. We note two slim dark stripes of discoloration of the silverplate extending from the underbelly up through the center band of decoration. Barely noticeable. Orion is one of the most universal mythological characters. Orion was the hunter of Taurus the bull, and Lepus the hare. Followed faithfully by his companions Canis Major, and Canis Minor, he is the dominator of the northern sky. Madly in love with the daughter of King Oenopion of Chios, Metrope, Orion was consistently denied marriage to her. His love for her raged, and while in a drunken stupor, raped Metrope. Oenopion consulted Dionysis, and found revenge. Dionysis cast Orion into a deep sleep, and plagued him with blindness. Upon awakening Orion sought the help of an Oracle. It told him that to gain his sight back, he would need to travel east, and let the rays of the sun strike his eyes. Orion did this, regained his sight, and later lived in Crete, where the goddess of the moon Artemis fell in love with him. Her love for him was so strong, that she failed to light the evening sky with moonlight. Orion's death came about when Apollo challenged Artemis to hit a speck among the waters of the ocean, not knowing that this speck was Orion swimming. Artemis shot a single arrow killing him. In response to her actions, Artemis placed Orion, along with his companions Canis Major, and Canis Minor in the sky, near the seven daughters of Oenopion, the Pleiades. Here they remained as the mightiest hunters of the night sky. All three pieces of the Pairpoint tea set have a beautiful patina. All three antique silverplate pieces of holloware share the touchmark of Pairpoint, the Pairpoint logo of a "P" within a diamond, quadruple plate and the pattern number "2026". You can learn more about the history of the Pairpoint Silver Company from our Silver Manufacturers pages.